Innovative Rotherham company, Xeros, is signing deals and generating interest from major global players as it commercialises the patented polymer technology behind the first real revolution in laundry in 60 years. In its financial results for the six months ended January 31 2015, the Xeros Technology Group reported income of £172,000, up from the £86,000 in the same six months a year ago. Debt free and with cash balances of £24.2m, the group continues to utilise money it raised by floating on the stock exchange to fund further research and development at its Rotherham HQ. £2m was invested in R&D during the period which resulted in an Adjusted EBITDA (earning before taxes) loss of £4.5m. Xeros is currently working with world leading chemical company, BASF to develop "Generation 2" polymer beads. In commercialising the polymer technology, Xeros has also proved its systems deliver superior cleaning, thanks to the polymer beads' ability to gently agitate stain and soil away from textile surfaces easily. The business model is more about the deployment and servicing of the patented polymer beads than the machines themselves. 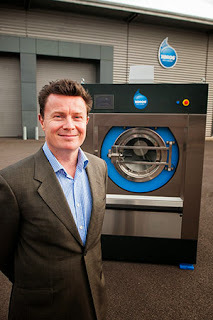 The company and resellers benefit from a monthly recurring revenue stream from services and sales of "Sbeadycare," the all-inclusive laundry management programme, to hotels, commercial and industrial laundries, dry cleaners, fitness clubs and spas. To meet the need of commercial customers, Xeros has introduced a new pricing strategy, to enable buyers to own the machines outright instead of leasing them. For Xeros, while the lower entry purchase price point for the machine results in an initial up-front loss on the cost of the machine, a greater monthly service fee will generate increased service margins for the Group and an improvement in gross margin overall over the course of a five year contract. The group is also working on a smaller 15 kg prototype which should launch before the end of 2015, and a Xeros laundromat concept store is due to open in the US before the end of the year. Bill Westwater, CEO of Xeros Technology Group (pictured), said: "The building blocks are in place for acceleration in our primary commercial laundry business. The combined impact of water scarcity and energy conservation, especially in our key US market, are now intense market trends. Our current enterprise customers are demonstrating that Xeros bead cleaning provides a robust and effective solution. This was clear from the excitement that we created at Clean Show 2015, with 61 channel partners signing up in four days to provide us with a scalable sales and service capability across North America." In domestic laundry, Xeros is continuing discussions with both machine manufacturers and detergent companies to become partners and produce and distribute Xeros machines as the business moves to end-user consumer trials. Beyond laundry the group is targeting the processing of leather in the multi billion dollar global leather industry, and has announced a joint development programme with LANXESS, a DAX listed global speciality chemicals business based in Germany with sales of €8.3bn. Working with the leading supplier of chemicals to the leather industry that supplies tanneries around the globe, scale up work will now take place, with the first prototype in tannery trials due in the second half of 2015. Westwater added: "It is not only in commercial laundry where we have seen success. The joint development programme announced today with LANXESS provides an entirely incremental opportunity to develop and ultimately commercialise a Xeros bead solution in the $50 billion leather processing market. Just as we did in commercial laundry, our team is set to move from positive laboratory trials to a prototype in a tannery before the end of 2015. "We continue to discuss partnership opportunities with major global players in domestic laundry. Our success in commercial laundry, especially as we move to smaller machines and end-user consumer trials, is creating greater interest from these global players. "We're hugely encouraged by the momentum building across the group's activities as we continue to deliver a superior performing Xeros bead solution for a world that can no longer depend on traditional aqueous processes." The share price of Xeros has risen from 130p on admission in March 2014 to close to 300p today.